Japanese Fleece FlowerDeciduous perennial. Can be very invasive, best kept in containers. Broad gree..
Leopard PlantSemi-evergreen perennial. Evergreen in mild winters. 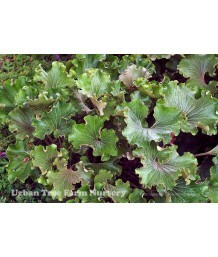 Large glossy deep green leaves str..
Leopard PlantSemi-evergreen perennial. Evergreen in mild winters. 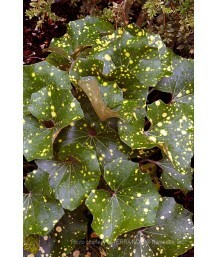 Glossy dark green leaves spotted w..
Leopard PlantSemi-evergreen perennial. Evergreen in mild winters. Matte grey-green leaves with tight.. Giant Leopard PlantSemi-evergreen perennial. Evergreen in mild winters. Large glossy deep green leav..
Leopard PlantSemi-evergreen perennial. Evergreen in mild winters. Rounded green leaves with narrow y..
Leopard PlantSemi-evergreen perennial. Evergreen in mild winters. Unique fan-shaped deep green leave..
Leopard PlantSemi-evergreen perennial. Evergreen in mild winters. Large glossy deep green leaves for..
Leopard PlantSemi-evergreen perennial. Evergreen in mild winters. Gray-green fuzzy leaves are kale-l..
Blue MargueriteDeciduous perennial. Deep green aromatic leaves form a rounded, bushy mound. From mid.. Bronze FennelDeciduous perennial. Fragrant herb used for anise-flavored foliage and flavorful dried ..
Beach StrawberryEvergreen perennial. Fuzzy, toothed, dark green foliage. 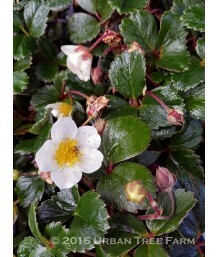 Up-facing white flowers blo..
Ornamental StrawberryEvergreen perennial. Used for groundcover and wildlife habitat gardens. Beautif..
Beach/Sand StrawberryEvergreen perennial. California native. Glossy, dark green foliage. Small white..
Beach/Sand StrawberryEvergreen perennial. 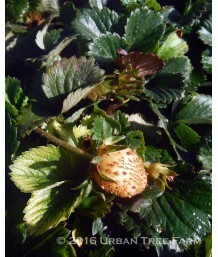 California native used for groundcover and wildlife habit..
Alpine StrawberryEvergreen perennial. Used for groundcover and wildlife habitat gardens. Beautiful d..
Alpine StrawberryEvergreen perennial. Used for groundcover and wildlife habitat gardens. 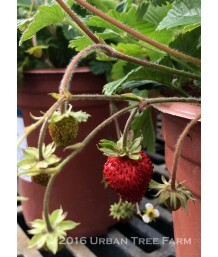 Beautiful l..
Alpine StrawberryEvergreen perennial. Fuzzy, toothed, dark green foliage. 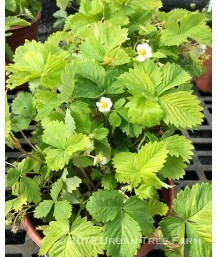 Up-facing, tiny white flow..
StrawberryEvergreen perennial. Fuzzy, toothed, dark green foliage. Up-facing white flowers bloom in ..
FreesiaDeciduous perennial. Green grass-like foliage forms a clump. Intensely fragrant white flowers..
FuchsiaEvergreen perennial. Shrubby habit. Elongated, vibrant green leaves on red stems. Dainty rosy..
Upright European FuchsiaEvergreen perennial. Wide, dusty green leaves with red veins. Orange-red, ha..